Insight | What do we know about Mars’ interior? 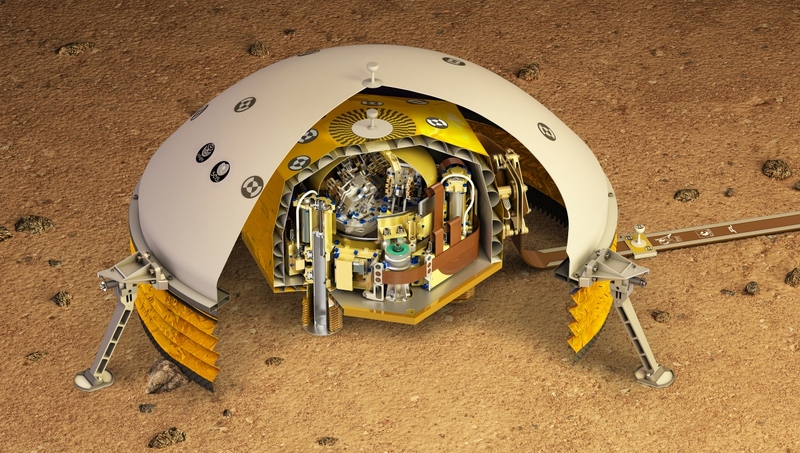 Home> CNES projects library> Insight> News and events> What do we know about Mars’ interior? The first missions to reach the surface of Mars date back 40 years, but many mysteries still lie beneath its top layer of iron oxide. To delve deeper into the red planet, the InSight lander is carrying a system able to drill down to five metres and sound Mars’ surface over a radius of thousands of kilometres. Following its arrival on Mars, we talk about what we already know and what we hope to discover there with CNES’s Francis Rocard, head of Solar System Exploration programmes, and Philippe Laudet, SEIS project leader for InSight and head of the agency’s Astronomy and Astrophysics programme. Mars lost its magnetic field between 3.9 and 4 billion years ago. It was generated by a dynamo effect fuelled by convection motions inside the planet’s core. But Mars’ dynamo shut down very early in its existence compared to Earth, because as a smaller planet it cooled more quickly. To measure how this energy dissipated and retrace the red planet’s geological history, InSight is going to drill down in stages of 50 centimetres. From the signals it measures beneath the surface and measurements from orbit, InSight will allow scientists to learn a lot more about the core. “Its radius is estimated to be 1,700 km, give or take 300 km,” says Francis Rocard. “With this mission, we should reach a precision of 75 km, in other words four times better. We should also be able to improve significantly on the current estimate of its density of 6.4—give or take 1—to reach a precision on the order of 0.3.” In comparison, the density of water is 1 and that of iron is 7.8. 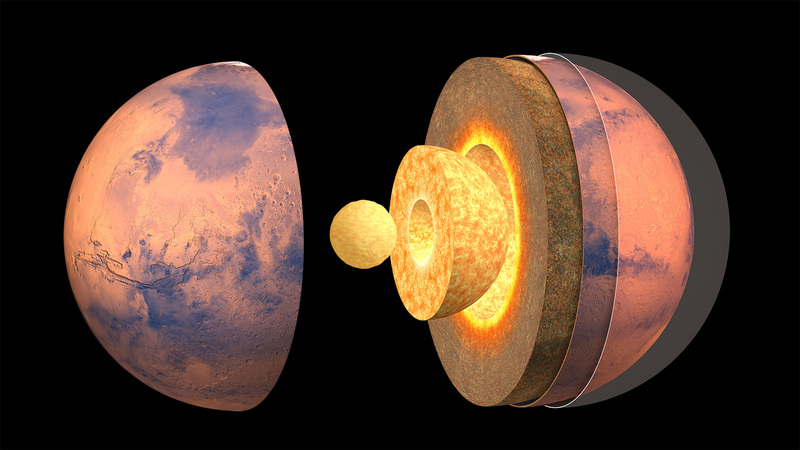 But, as Mars cooled so quickly, we don’t know if its core is still liquid or completely solid. To find out, we’ll need to measure the planet’s ‘wobble’ about its spin axis from the vantage point of orbit. To do that, the RISE instrument (Rotation and Interior Structure Experiment) will use InSight’s communication antennas and orbital relays (Mars Orbiter, Mars Odyssey, probably MAVEN and ESA’s TGO). Earth’s axis of rotation is tilted 23° to the equator, which is what gives us our seasons. This tilt varies only slightly, between 22° and 24°, as a result of the stabilizing effect of the Moon’s mass. But on Mars, with its two small moons, the axis of rotation is much more unstable. It’s currently tilted 25°, but has experienced extreme shifts to more than 60° over the last billion years, and almost 90° over the last three billion years. Mars was volcanically active in the past—indeed, very active—if the volcanoes on Tharsis Rise are anything to go by. However, no subduction zones are visible at its surface, which is not being renewed. 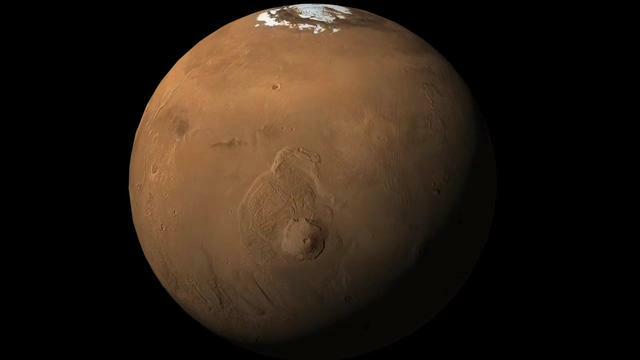 This is what has maintained the volcanoes above their hotspot and made them such towering features, Olympus Mons peaking at a height of 22.5 kilometres. The last lava flows would appear to date back only 2 million years, which is nothing on the geological timescale, so Mars may still be volcanically active today. Before SEIS, there haven’t been many examples of extraterrestrial seismology. The Apollo 11 mission left a seismometer on the Moon in 1969, but it only operated for a month until its battery ran out. Apollo 12, 14, 15, 16 and 17 each carried a seismometer (ALSEP for Apollo Lunar Surface Experiments Package), forming a network that operated up to 1977 thanks to the instruments’ radioisotope thermoelectric generator (RTG) power supply. This experiment enabled scientists to study the Earth-Moon system and ascertain their common origin. At the same time, NASA was already preparing to send two seismometers to Mars aboard the two Viking landers. But when they arrived in 1976, Viking 1’s failed to uncage and was thus inoperable, while Viking 2’s was fixed to the lander’s deck and thus sensed all its parasitic movements, in particular those induced by winds. The story of SEIS began in the 1990s, when Philippe Lognonné at IPGP started developing a first seismometer designed to study the interior of another planet. This instrument, called OPTIMISM, was accepted for the Russian Mars 96 mission and lifted off with it in 1996. Unfortunately, the Proton launcher experienced a mishap and after only a few orbits Mars 96 fell back to Earth and burned up in the atmosphere. Seismology on Mars would therefore have to wait for a future mission opportunity. InSight was initially planned for launch in 2016, but in late August 2015 during testing at CNES, the sphere housing the three very broad band (VBB) seismometers designed by IPGP/Sodern suffered a leak when subjected to a temperature of –50°C. To avert any possible hitch, NASA decided to push back the launch to 2018. “You run a marathon for 20 years and then a 7-year sprint,” quips Philippe Laudet. But unlike on the Moon, there will be nobody to deploy the seismometer on Mars. InSight’s robotic arm is scheduled to be deployed around 10 December and then set down SEIS on the surface of the planet between Christmas Day and New Year’s Day. Its shield should be positioned over it around 5-10 January 2019, and everything should be ready to start beaming back the first science data in early April. Confirmation of the landing should arrive back on Earth this Monday 26 November at 20:53:40 precisely. InSight will land in the Elysium Planitia plain, at the Martian equator, and then deploy its two circular solar panels to power its instruments for a planned two-year mission. 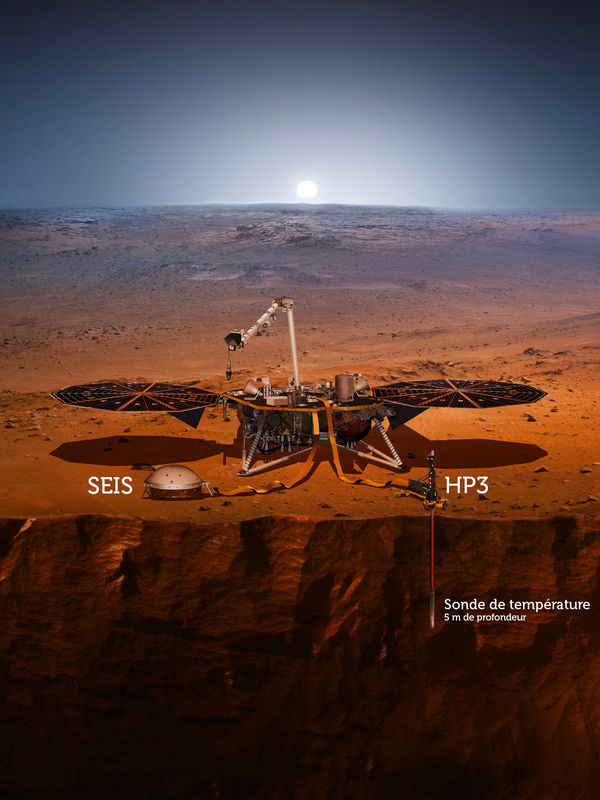 InSight with its French SEIS seismometer (left) and German HP3 heat probe (right).